The story goes that i was 2 when my dad brought me to Accra. We left his hometown of Sefwi Wiawso in the Western North region of Ghana. My mother was in school, training to be a teacher so we both migrated south, without her. I remember oatmeal and Joyfm. My dad, who was effectively a single parent, made me lots of oatmeal for dinner and breakfast. He also gave me a small radio which was part of a surround system. I'd put it next to me as i lay on my twin mattress on the floor and listen to JoyFm. I remember a lot of these moments. This past weekend, my uncle (all your parents friends are your uncles and aunts in African communities. Blood or not), who had lost his mum on Christmas day of 2018, held her funeral in the village. I had hesitated all month long. I didn't want to go. But my folks insisted that i had to be there. In the first weeks and months of being in Accra, he(my uncle) lived with us (as a ward of my dad) and helped my dad take care of me. We had maintained contact throughout the years so we are now, indeed family. Family mourns family. So off we went. I thought it was a 6 hour journey from Accra. Joke was on me. I didn't factor in burst tyres, overheating, refueling and police stops. It took about 12 hours to get into the village. 30 minutes out, we were met with heavy rainfall and zero visibility. My dad, being the stubborn guy he is, insisted we drove through. So like turtles, we drove through the rain till 10 pm when we finally arrived. Whew! I instantly remembered my grandmother's house. Maternal. Somehow, even though they are from different parts of the country, my grandparents settled in this town, lived side by side and never left. I remembered the red gravelly sand, the large gutter and how my late granduncle loved to eat cans of corned beef next to it. I lodged at the hotel of the man who stood in for my father at my Christening. My dad was in a study abroad program when I was born. I recognized this man from the photos taken on the day, which is super weird to me. Our brains' capability to store information on this level is astonishing to me. I'd often say I'm from Accra because I have no time to be explaining to people where my people are nestled. The Sefwi people live on hills in the middle part of the former Western region. Our language, which everyone in my family speaks fluently, is Sefwi. It is an interesting mix of Asante Twi, Nzema and Aowin. The Sefwi people, historically, sought freedom from the powerful Aowin people and away from the prying eyes of the Asantes, so they built their homes from a strategic point, on hills. Too difficult for enemy forces to climb and with no knowledge of how to breach the terrain, left them alone. Till this day, they live the same. 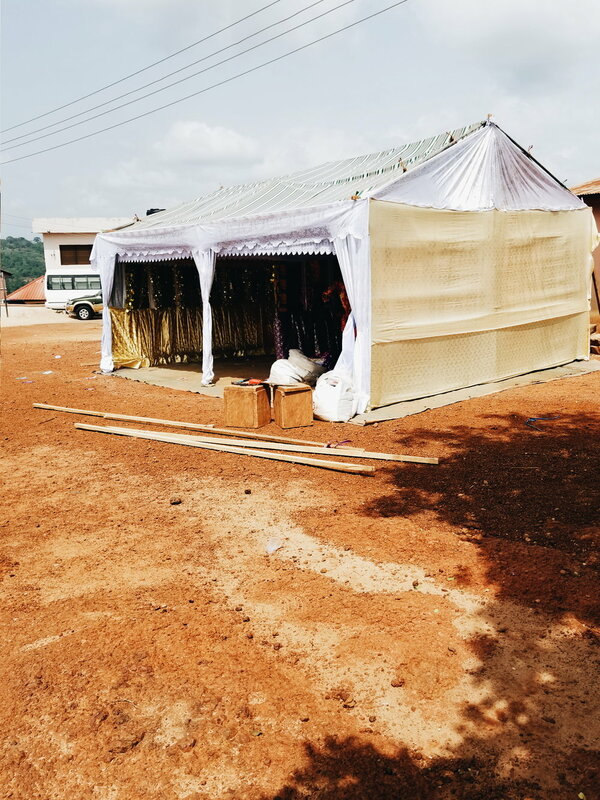 Sefwis belong to the Akan ethnic group and in typical fashion, love funerals. The process of finally laying a loved one to rest is hella complicated and lasts typically all weekend. The different rites and customs require several outfits, a detail I was not aware of. Everything about the process was mind blowing to me. I surveyed my “nearby” on Google maps when I checked into the hotel and saw a synagogue. A Jewish church in this remote village. I had to see it. I hiked for about 15 minutes and the only thing I ended up discovering was that I was severely out of shape and needed to start working out again. During the funeral rites, I kept hearing people saying “WA F3. WA F3 PAA” over and over. This literally means “She was tired. She was very tired.” My uncle’s mum had passed after a long battle with illness. There was a sense of relief yet sadness amongst mourners. I do know she will be sorely missed by the village and her family. It makes you think of how you are spending your days on this earth. It was an interesting trip overall. From everyone calling me fat, to assuming that I am my dad’s second wife to exclaiming at how much I looked like my mother, I was home. Among my people.